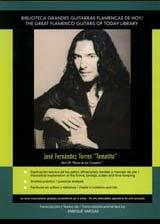 The complete transcription of the historic CD "Paseo de los Castaños" by Tomatito, one of the most influential flamenco guitarists of our times. Maestro Enrique Vargas has chosen this CD for two reasons: first, because its musical value is unquestionable and second, because this recording like no other reflects the versatility of the artistic trajectory of this guitarist and composer. This work demonstrates a wide palette of styles and influences that Tomatito made his own: from a dazzling and very jazzy jam session with the great George Benson to a fiesta por bulerías in a wine cellar en Jerez de la Frontera in a pure Gypsy style, from an Argentinian bolero to a profoundly ancestral solea, from tangos flamencos so "Tomatito" to a Turkish folk song with a string cuartet.
" Tangos pa' la Pimpi "
These tangos , recorded in an unusual tuning includes a cante verse sung by the guitarist's daughter, with a complete transcription of the singing melody and the accompaniment. 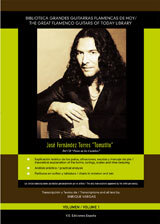 The mandola solos by Juan José Suárez "Paquete" have been transcribed for second guitar. The chord symbols have been included throughout the chart for those who want to learn to accompany this piece. This soleá reveals an incredible mastery of the jondo (deep) forms by the artist. His playing here is a combination of Gypsy purity and a modern harmonic and melodic language. Bulerías "Paseo de los Castaños"
The bulerías by Tomatito are incomparable. Played with otherworldly feel and sense of rhythm, this palo has become Tomatito's trade mark. Recorded in the traditional key of A Hijaz ( por medio) these bulerías o ffer an ideal study on various possibilities in rasgueados and remates for this difficult to master form. The accompaniment of the second guitar in the beginning and the end of this piece has been also transcribed. This bolero is a duo of Tomatito's guitar and a violin by Bernardo Parrilla. The violin part has been transcribed to the smallest detail and can be interpreted by a guitar or any instrument you may wish to chose. Tomatito's accompaniment is a lesson in a proper use of harmonic substitutions worthy of unforgettable Joe Pass. This rumba, with a strong influence of Cuban son and Brazilian samba is a duel of powerful guitars by Benson and Tomatito. All the solos and accompaniment have been transcribed entirely. This piece can be interpreted by a single guitar or a duo. This beautiful and very emotional taranta is a perfect example of the evolution of Tomatito's harmonic and melodic language. Although full of modern chords and scales, this piece expresses the most ancestral sentiments with the flamenco purity so characteristic of Tomatito. This piece, composed in the modern key of D# Hijaz, is tremendously difficult, both rhythmically and technically. As in every transcription done by the maestro Enrique Vargas, the parts of the second guitar, the mandola, as well as two voices of the cante have been transcribed in their entirety. Chord symbols are provided throughout the whole piece, which is accompanied by detailed explanations of the toque as well as extended analysis of the most difficult falsetas. This piece can be interpreted as a solo as well as a duo. Turkish song " Bir Ömürlük Misafir"
In this piece, for the first time in the history of flamenco guitar transcriptions, the full orchestral chart is provided for those who have Sibelius or Finale software. They can either scan or enter manually the chart into their computers in order to be able to enjoy playing this piece with the full orchestra sound. Obviously, this transcription is destined to those who wish to learn to accompany the cante. To make the task easier, I transcribed the voice track in its entirety, which also makes it possible to play these bulerías with another musical instrument. It should be kept in mind that notation has certain limits when transcribing cante which has lots of microtones that are impossible to write on paper. To sum it up: this piece is a brilliant lesson in compás and rasgueados interpretation and cante accompaniment, where Tomatito uses infinite right hand finger combinations to strum the strings, each finger carrying its own sound and shading, creating a pure and intense swing. The transcription of these bulerías is accompanied by the detailed explanations of the toque as well as extended analysis of the most difficult letras and techniques.